On 2009’s Secret, Profane & Sugarcane, Elvis Costello teamed with producer T Bone Burnett and a talented string band for a set of heartfelt numbers which mined various stripes of the Americana ore. This 2010 follow-up features almost the same band (with guest appearances by Vince Gill, Buddy Miller, Jim Lauderdale, Leon Russell, and others), a similar Tony Millionaire cover cartoon, and a kindred concentration on non-rock stylings. But where Sugarcane focused on the topic of love, this one casts a wider net, exploring the next-greatest force in the universe – money – as well as war, poverty, infidelity, scandal, assassinations, the economic woes of the ‘00s, and the demoralized people left in its wake. Over the course of 16 tracks, Costello flexes his stylistic muscles and exercises that famously acerbic wit. Although the chugging “National Ransom” establishes the lyrical theme for the album, decrying corruption in the upper echelons and chaos and disillusionment in the lower ones, it’s the second song, “Jimmie Standing In The Rain,” that sets the tone in every other way. Although not explicitly about Jimmie Rodgers, the track follows the sad final days of a broken-down cowboy singer stranded in England, a once-mighty singer now undervalued and isolated. The narrative unfolds slinkily, more British music hall/Denmark Street than Country and Western, further removing the subject from his proper context. Is “Jimmie” the beleaguered post-9/11 United States, yodeling fruitlessly on the world stage, formerly admired and now “loose change lonely”? After that auspicious start, Costello and his rotating band create one golden moment after another. The soulful piano ballad “Stations Of The Cross” artfully examines lurid crime scenes and natural disasters through the lens of the media gawker, while “Slow Drag With Josephine” is a fun and catchy “jass” cakewalk with an all-too-rare whistle solo. “Five Small Words” (those words being “Don’t you love me anymore?”) is a percolating country shuffle with a twin-twang guitar attack and a joyous vibe that belies the despair of the lyrics. 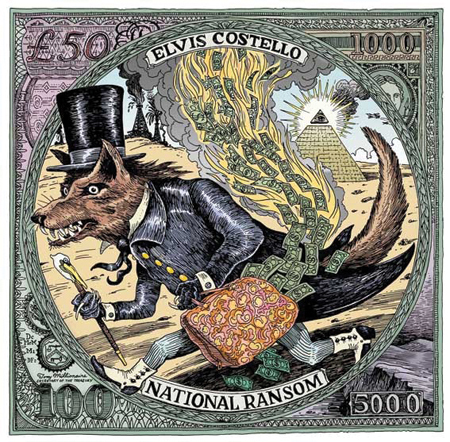 The album peaks in the middle with three of Costello’s finest songs in years. “Bullets For The New Born King” is a poignant tale of a political murder (“Hands and bells are only there for the wringing/As we were bringing bullets for the new-born king”), couched in a spare acoustic folk setting, with a sweet melody that recalls pre-World Beat Paul Simon at his best. Vince Gill guests on the dark and stirring bluegrass-inflected ballad “Dr. Watson, I Presume,” followed by the atmospheric “One Bell Ringing,” which starkly recounts the last moments of an executed prisoner or hostage. A clarinet and flute double the vocal melody; the haunting minimalism of the arrangement echoes the sparse poetry of the lyrics, resulting in one of Costello’s most understated, yet powerful efforts. After these high points, and the bouncy Jim Lauderdale collaboration “I Lost You,” the record provides relatively undistinguished but perfectly respectable turns at jump blues (Leon Russell’s “My Lovely Jezebel”), rumbling rock and roll (“The Spell That You Cast”), tear-in-your-beer country (“That’s Not The Part Of Him You’re Leaving,” “All These Strangers”) and croonable pop standards (“You Hung the Moon,” “A Voice In The Dark”). The latter is one of the few lyrically upbeat numbers, and it’s hard to tell if the optimism in lines like “When liars and bullies conspire to stamp out spark/Fill up that empty space in your heart” are meant to be consoling or mocking. In any case, the relentlessly jaunty tune ends things, at least musically, on an upswing. The only arguably weak link in a strong set of songs is “Church Underground,” an overwrought noir ballad about a saloon singer who never finds the peace or justice she seeks. While it’s great to hear Steve Nieve pounding the grand piano, the hard-luck tale is steeped in brassy-dame clichés, and Costello overdrives his voice into a bellow. Once again, T Bone Burnett is a sympathetic conspirator, combining his two greatest strengths – a sensitivity to the nuances of intricate songs, and a gift for warm acoustic arrangements. As for Costello, Americana and the American songbook, with occasional forays into rock, are respectable choices for him. As he passes the thirty-year mark of his career, it is heartening to watch him continue to build and expand, without overreaching.